Absolutely beautiful, WELL-MAINTAINED, SPLIT-LEVEL RANCH w/ 2-CAR GARAGE on CUL-DE-SAC Street. SPACIOUS, OPEN-FLOOR PLAN perfect for entertaining family, friends & pets. Great Room w/ FIREPLACE & VAULTED CEILING. FORMAL Dining Room. HIGH-END BAMBOO & CERAMIC TILE FLOORS THROUGHOUT (11/2015). NEW ROOF & CHIMNEY CAP (2014). NEW AMANA ENERGY-EFFICIENT HVAC (2015). WATER HEATER (2011). KITCHEN APPLIANCES & DRAPERIES REMAIN. WALLS & TRIM FRESHLY PAINTED. Master Bedroom w/ VAULTED CEILINGS & WALK-IN CLOSET. 2 spacious additional bedrooms, one w/ COZY WINDOW SEAT * Laundry Room. LARGE YARD w/ FULL PRIVACY FENCE & RECENTLY STAINED DECK great for entertaining. Sidewalks in subdivision. CONVENIENTLY LOCATED. 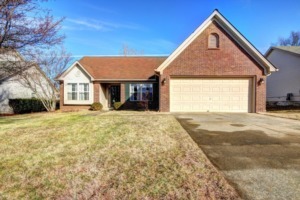 Click to schedule your showing.